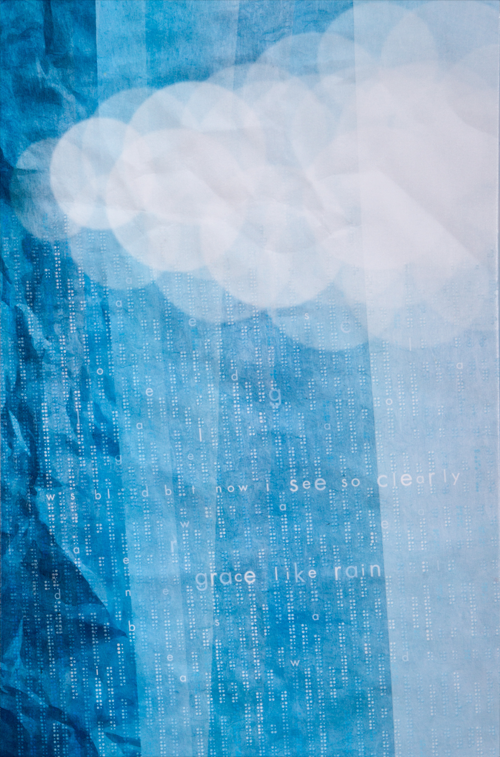 I was inspired by the song “Grace Like Rain” by Todd Agnew to reflect its deep and yet simple and spiritual meaning to create this digital abstract art on canvas. The cloud and rain is created in Braille and English and serve as a metaphor, which represents seeing God’s grace and salvation (The raised Braille transforms and becomes English as our eyes are opened). The line of the song, “Was blind but now I see so clearly” is amplified to communicate this message. I created the raised Braille by using drops of Elmer’s glue in several layers. The best viewing to see the raised dots are at a 45 degree side angle. The wrinkled and contrasting shades of blue translate the darkness in life to God’s Glory of Light. The Grace rains on everyone from the fluffy lamb-like cloud(s), which is a representation of the Lamb of God, who died for our sins and washed away our stains. *The Braille system is a method that is widely used by people who are visually impaired to read and write, and was the first digital form of writing. To learn more about Braille, go to The Braille Institute of America. Hallelujah all my stains are washed away, they’re washed away.